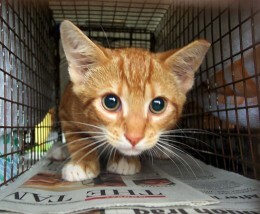 TNR stands for Trap-Neuter-Return; also known as TTVAR (Trap-Test-Vaccinate-Alter-Release). It is a method of humanely trapping unaltered feral cats, spaying or neutering them, and releasing them back to the same location where they were collected. TNR is promoted by the ASPCA as humane and as a more affective alternative for euthanasia in terms of managing and reducing feral cat populations. This procedure has been proven to work by stopping the birth of new cats in the colony and letting the colony members live out their lifespan, approximately six years for outdoor cats, with their own group. Generally a colony will have no more than twelve adult cats at any one time. If there are more than that number the colony will discourage newcomes and some of the current members may look for other food sources - neighboring houses, etc that have food to offer. Feral cats have many advantages as pest control for people that own acreage and/or have a farm environment. Feral cats are generally excellent hunters yet a large part of the feral cats diet is usually insects. TNR programs are now being introduced in some urban and suburban areas. Although not all animal hospitals are comfortable or equipt to handle feral cats, it is becoming increasingly simpler to find ones that are. DPC is proud to be one of the few animal clinics in Broward County that not only will handle feral cats but offers discounted prices for the services as a courtesy to TNR volunteers. To learn more about the protocol for bringing in ferals, or the pricing for the services just call our office at 954-989-9879. The services offered for ferals can range from the minimum - a Rabies vaccination and a spay/neuter; to the combination test for Feline AIDS/Leukemia and full vaccines. Wound care is also available if desired. An ear notch is always offered at no charge. The benefit to an ear notch is that it lets other trappers know that this cat has already been altered; and it prevents you from re-trapping the same cat again for future TNR. A feral cat is a descendant of a domesticated cat that has returned to the wild. It is distinguished from a stray cat, which is a pet cat that has been lost or abandoned, while feral cats are born in the wild. The offspring of a stray cat can be considered feral if born in the wild. A truly fairly cat will need to be trapped. He or she may display aggressive behaviors varying from hissing and growling to biting and scratching. Hissing and growling are self-defense behaviors, which, over time may change as the animal begins to trust humans that provide food, water, and care. A feral cat that has been fed over a period of time may begin to show less aggressive behavior to it's feeder but will still show this aggression toward newcomers, and will not be domesticable. The cat will not be easily sociable meaning that bringing a feral indoors is not advisable, especially when other cats are already in the household. ARE YOU THINKING OF BRINGING A FERAL INTO YOUR HOME? Always remember that a feral cat may harbor a variety of illness and disease which may be communicable to other cats that share it's environment or space.This also applies to strays which means if at any point you want to bring a found cat indoors you will need to have it examined and tested in order to know that it is safe to have the new cat among your others. This applies for both adult cats and kittens. Feral cats that are born and living outdoors without any human contact or care have been shown to be adoptable and can be tamed by humans, provided that they are removed from a wild environment before truly feral behaviors are established. The older the cat is the less likely it is that the feral will be able to be tamed. Most ferals that are able to be turned to house cats are brought indoors within it's first few weeks as a kitten. It is common for people to inquire about the lifespan of a feral cat. A feral cat's lifespan may range between 0 to 8 years; with the usual median lifespan being 4-5 years of age. In contrast, a cat in captivity can live 10+ years, with many living in excess of 12-14 years. HOW DO I BRING IN A FERAL? A feral must be brought into the clinic in a proper trap. Live animal traps are available for purchase from places like Lowe's, Home Depot, or certain feed stores. Some large chain stores such as Walmart have also been known to carry them at certain locations. DPC has traps available for rent whenever we have enough in stock. The trap rental fee is a $100 deposit, refunded at the time of return if the trap is in the same condition it was taken in. The rental fee is $10 per week, with the first week paid at time of rental. Feral cats cannot be taken in if brought in carriers. The reason for this being that even if the cat is "friendly" toward you, the trapper or feeder, it may still prove aggressive toward the staff. It will also prove increasingly difficult to transfer the feral into a cage if not in a trap, and nearly impossible to get it out of the cage at pick up if not going home in a trap. For the safety of both the cat itself and the staff we require that all ferals come in traps, and that only 1 cat comes per trap. If you'd like to know more about feral cats or are inquiring about how to bring in feral cats for spaying & neutering, visit our website www.dpcvet.com or call us at 954-989-9879!